Micah and I had been making more trips than usual to Eldo, trying to cross some of the more obscure, difficult routes off our list. Always working his weaknesses, Micah was on a ‘hard single-pitch redpointing’ binge at this time because he knew it would make him strong for the ‘real’ mountains. We’d had to make several return trips to finally redpoint some of the harder routes that had thwarted us. With Micah standing about 5’6” with little “chisel tip fingies” as he’d say, and myself at 6’4” with paddles for hands, our noses were about the only thing of comparable dimension, and for that reason we could never share the same beta on routes. Fortunately, this was a great excuse we’d commiserate on when neither of us sent the route, leaving us to come back another day. We knew logistically we weren’t ideal climbing partners for this beta-intensive single pitch stuff, but we always told ourselves that our difference in size would make us great partners in the mountains. “There’s no crack size out there that wouldn’t take one of our hands, feet or limbs,” we’d say, as ‘perfect hands,’ after all, always depend on whose hands you're talking about. Either way, we were just stoked to get out and climb together, and since we were having to make return trips to crags, Micah had started to comfortize things a bit. Squirreled away in cold, sunless boulder chasms, Micah had stashed a couple beers here and there – namely Boddington’s or Beamish, in a can. The original plan was to have these savory beverages as our reward, to toast our successful redpoints and sooth our tattered hands. We quickly learned, however, that these beers could become the ace up our sleeve. It was on one occasion at the Rincon Wall when we grew impatient after being repeatedly bouted by a route. We uncovered the secreted fruits prematurely, desiring something cold to sooth our aching egos. We cracked a tall can and shared it, kicked back, taking in the view, telling jokes and laughing about life. Time got the better of us and we soon found the bottom of the Boddingtons, with jovial spirits and a relaxed demeanor….which as it turns out, is an ideal state of mind and body for redpointing your project. Well rested and with refreshed focus, we both sent the route next try. Ha! Go figure! We each clipped the chains, pulled the rope, packed our things and hiked out, grinning and giddy about the day, chatting about the next route we’d get after. I love a good climbing story. I also love a good story about a friend whom we’ve lost. They hold our every attention and wrestle with our emotions. In that shared moment of remembering – drawing the lines of their face in your memory and animating their expressions as the story rolls along – they are present again. In May 2009, Micah Dash, Jonny Copp, and Wade Johnson perished in an avalanche during a climbing expedition in China. Gluttons for the mountains and adventure, those guys were living their wildest dreams and always shared those stories with wanting ears. To carry on their legacy, we established the Copp-Dash Inspire Award to support talented and motivated climbers in living their wildest adventures and bringing their stories back for us. It’s the words, images and art that they bring home from a field that keep the rest of us awed and inspired; passing the torch to share another good story with good friends around our campfire. The Copp-Dash Inspire Award will help support small teams tackling difficult climbs in the great mountains of the world who plan to personally document and share their ascents through a multimedia blend of storytelling elements. Proposed trips should be focused on unclimbed objectives in distant ranges and regions, requiring a high level of skill and commitment. Climbs should be done in a fast, light and clean style that stays true to the progression of expedition climbing. Proposed documentation styles can include any mix of photos, video or writing that will vividly capture the essence of the trip or climb. Proposed sharing of these storytelling elements could involve slideshows, viral film clips, magazine articles, multimedia presentations, etc. 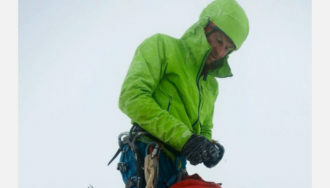 The Copp-Dash Inspire Award provides a pool of $20,000 in grants to North American climbers for expeditions between May 1, 2011, and February 28, 2012. Applications for the Copp-Dash Inspire Award will be accepted from January 1, 2011 to March 31, 2011. Only teams/individuals from North America are eligible. Award winners will be announced by April 30, 2011. Find a complete list of last year's award winners here.